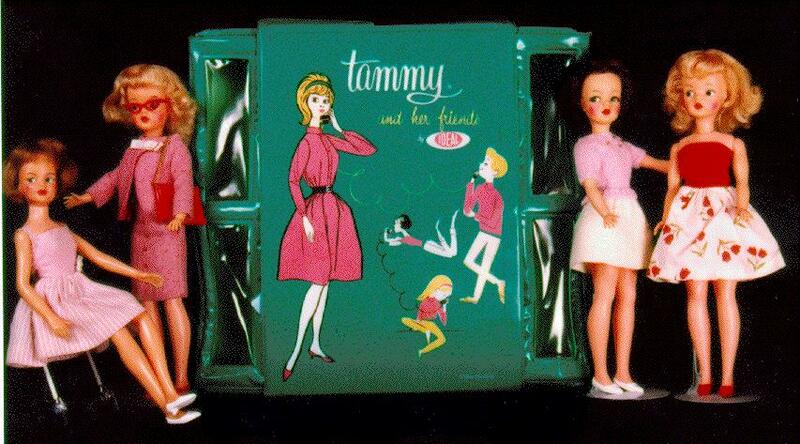 A selection of Tammy dolls by Ideal, circa 1964: from left -- Grown Up PosN Tammy, in tagged Tammy dress. Platinum blonde Tammy (regular straight leg) wearing "Career Girl" tagged Tammy outfit. 2-doll Tammy telephone booth case, each corner door opens in to a little phone booth!. Brunette tammy, wearing tagged Tammy clothes. Platinum Tammy, wearing "Dance Date" Tammy fashion.